Daily guided tours of the stud commence at 10h30, 12h00, 13h00, 14h00, 15h00 and 16h00, lasting approximately 45 minutes. 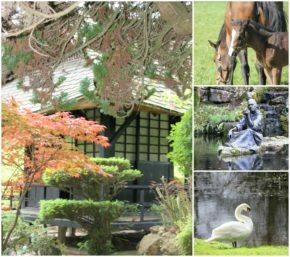 To find out more about Irish National Stud, Japanese Gardens & St. Fiachra’s Garden, simply visit their website or call, + 353 45 521 617. Among the most loved of all Ireland’s gardens, the Irish National Stud’s Japanese Gardens are a veritable feast for the eye and ear with the sight and sound of trickling streams perfectly complementing the greenery and vivid colours that provide a tranquil backdrop to the beautiful Bridge of Life and Tea House.The Japanese Gardens are a place for contemplation, meditation and reflection. Since they were first enjoyed more than 100 years ago, they have never failed to please. Step into St. Fiachra’s Garden and enter another world, one to which you will wish to return again and again. The garden, designed in 1999 by award-winning landscape architect Professor Martin Hallinan and named to commemorate St. Fiachra, the patron saint of gardeners, provides a perfect partner to the Irish National Stud’s Japanese Gardens while, at the same time, opening up a wholly different yet equally satisfying experience. This stunning attraction seeks to capture that which inspired those involved in Ireland’s monastic movement in the 6th and 7th centuries. It does so principally by paying handsome tribute to the Irish landscape in its rawest state. Rock and water are rulers in a garden rejoicing in the natural beauty of woodland, wetland, waterfalls, lakes and streams.